Attractive, dense, upright grower makes a great hedge, screen or windbreak. Large clusters of fragrant white flowers followed by showy red fruit that matures to black. Leatherleaf foliage is evergreen to zero degrees Fahrenheit. 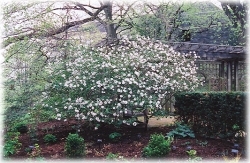 Showy evergreen shrub blooming white in spring featuring blue colored berries in the fall. Plant more than one for cross-pollination to ensure consistant berry production. This acid-loving plant is perfect for a foundation planting, border or hedge. Attracts butterflies and birds and is deer resistant. An evergreen shrub, commonly called leatherleaf virbunum, which can ultimately reach a height of 6-10'. Produces creamy white flowers in the spring and berries in early fall, which first appear red and then change to a glossy black. Berries will often persist to the end of December. Makes a nice evergreen hedge. 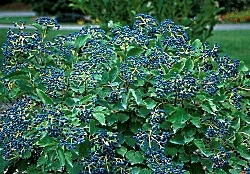 This cranberry bush Viburnum is a dwarf, low-growing, densely branched, deciduous shrub which typically matures to 2' tall with a similar spread. 'Nanum' is a non-flowering and non-fruiting cultivar. Reddish purple fall color. Excellent low hedge, foundation plant or border filler. 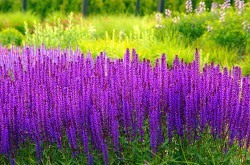 A beautiful plant that blooms in clusters of fragrant violet blue flowers over an extended season. 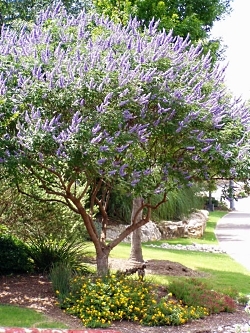 Becomes a small tree over time with a wide open canopy and aromatic gray-green foliage. Thrives in heat. Exceptional patio tree. Deciduous.